My dear friend, and eight-track format historian, Bucks Burnett (visit his eight-track museums in Dallas, and Roxbury) sent me a couple of unique 33 1/3, 7" discs this summer - two Denver-based spoken word pieces from Dr. Mark Morris. Mark Morris (to those unfamiliar with veterinary history) was the founder of Morris Animal Foundation, the world's largest non-profit organization, funding humane animal health research and studies. To most folks, he's best remembered as the guy who developed Science Diet and Hill's, the largest pet food company in the world (and since sold to Colgate). 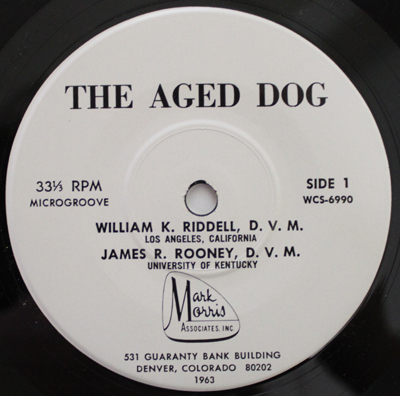 Sometime in his busy schedule he also started up a veterinary education record label. No telling how many of these were produced, and how many topics there are, but the two records Bucks found are dated 1961 ("Diagnosis and Management of Liver Disease"), and 1963 ("The Aged Dog"). 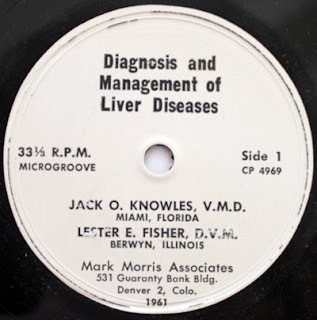 "Diagnosis and Management of Liver Disease"
Dr. Morris passed away in 2007, at the age of 72. The Morris Animal Foundation, based in Denver, continues on in his name.